What creates exceptional leadership today? What if you could “peek inside” the relationships of thousands of leaders with their teams, colleagues, supervisors, and even customers – what would you see? Hint: It’s a about people-leadership. 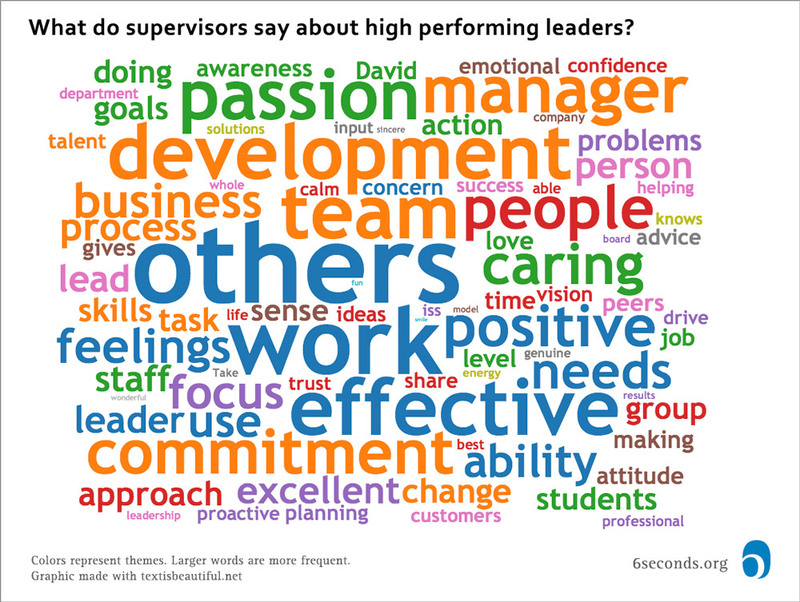 In our research to create the Brain Talent Profile, we analyzed thousands of anonymous open-text comments about high performing leaders. We coded these to identify specific talents, and distilled down to 18 essential talents for breakthrough performance. In the process, we were moved by the incredible comments about these leaders – and found that there are certain themes that distinguish strong leaders from exceptional ones, particularly in the realm of people-leadership. If you had a magic wand, what would you like your people, colleagues and supervisors to say about you? The most hard working and conscientious person I have ever worked with – she is a brilliant leader and always considers the feelings of those around her. He always makes himself available to everyone within the organization. A fantastic people-person. Genuinely has our best interests at heart while also staying focused on the organization’s goals and business needs. Empowers his team to take control of their operation, doesn’t shy away from making decisions or taking chances. Definitely the most trustworthy person I know. She is totally fab, really concerned with everyone on her team and how she can help. What would you call a leader who embodies these characteristics? We extracted two variables from our SEI360 database : Performance and open text answers to the question, “what is s/he doing now (that is effective) that you’d like to see continue?” Then we used “Lexalytics”, “textisbeautiful.net”, and manual coding to conduct semantic analyses of the high performers versus the highest performers. Overall, you can get a sense of the comments from the word cloud above. Textisbeautiful uses a slightly different mechanism to create associative clouds – where concepts are expressed in color-coded themes. In both cases, the biggest word is “others,” suggesting a people-focus, but note the other words in blue. 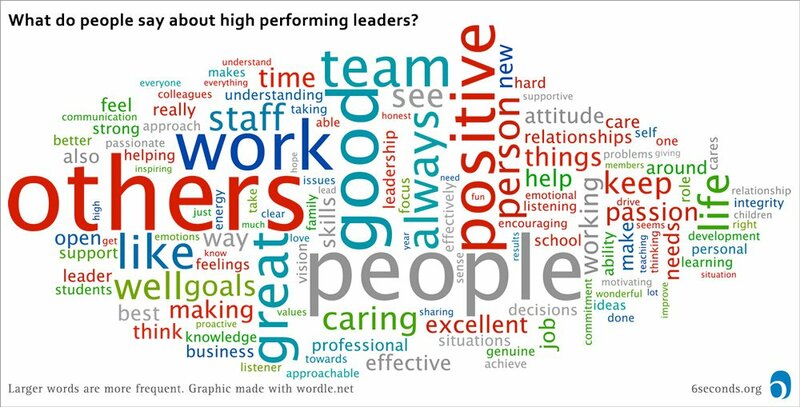 For high performing leaders, “others” is associated with effective work, then feelings and needs. 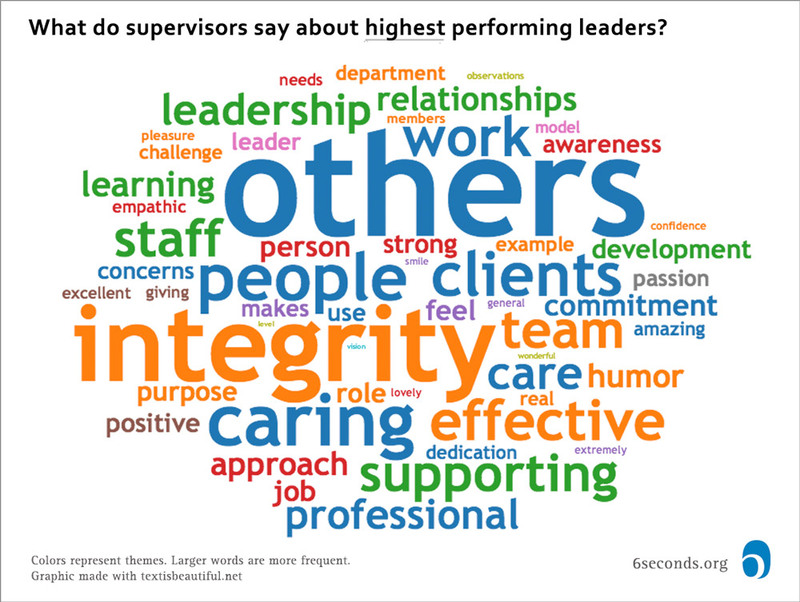 For the highest performers, “others” is associated primarily with caring about people and clients. This is the essence of “people-leadership” — the blend of empathy and performance. Using the associative concept webs, and the weighted themes identified by Lexalytics, here are some characteristics that make top leaders stand out from the supervisors’ perspective, in approximate order of priority. Create feelings for others to work effectively. Care about others. Inspire clients, listen to people. Develop team to manage business process. Develop leadership & passion to support people. Focus, drive results. Maintain clear priorities. Model good attitude. Maintain calm. Make people smile. Give positivity. Passion and purpose are infectious. Top performers go deeper emotionally – not just caring, but personal caring. Not just a good attitude, but giving the energy for people to smile. From the perspective of colleagues, we see a similar split, but now the “people-first” skills of top performers are even more visible. Care about others, inspiring people in the business. Coach people, help others. Create lasting relationships. Develop people at work, people skills, listening, being proactive. Share knowledge and emotion so people feel the vision. Positive, helping attitude. Inspire, lead so people believe. Always positive. Achieve results. Care about people and goal, empathy, sharing, helping. Attend to needs, focus on team, keep learning. Encourage strong work with fun & calm. Effective processes. Be effective and sensitive; Loyal to both people and business. Stay in communication. Learn through projects, feedback. Again, results matter and these highest-performing leaders are generating results with and through people – and emotions. Emotions drive people, people drive performance. In the High Performers group, we see a focus on paying attention to people. In the Top Performers group, we see a focus on creating emotional conditions for people to thrive. Value and respect staff. Create a positive team where people feel unity & support & are effective. Support people, encourage. Give time & personal care. Make time for people. Personal connection. Mentoring behavior. Take care of management issues, with integrity; trustworthy. Happily lead the group, create process to deal with important issues. Provide ideas, vision. Maintain relationships, create caring culture. Create a positive team with goals, drive, passion. Create excellent emotional interactions, client focused. Make solutions, keep focus. Encourage ideas, care as a leader lead so everyone cares. Talk, ask questions, be aware. Listen to everything, appreciate individual needs. Extremely effective style; insight working with people to address the issues and therefore allow people to grow and develop to their full potential. Constantly communicating, giving feedback & encouragement. Makes us feel as though we are a team and working together, rather than being dictated to. He is able to create a comfortable environment during meetings where we feel comfortable to say what is on our minds as well as having a bit of a laugh. Open and honest, open door. Willingness to create time for me makes me feel important. Makes you want to do more because he cares. 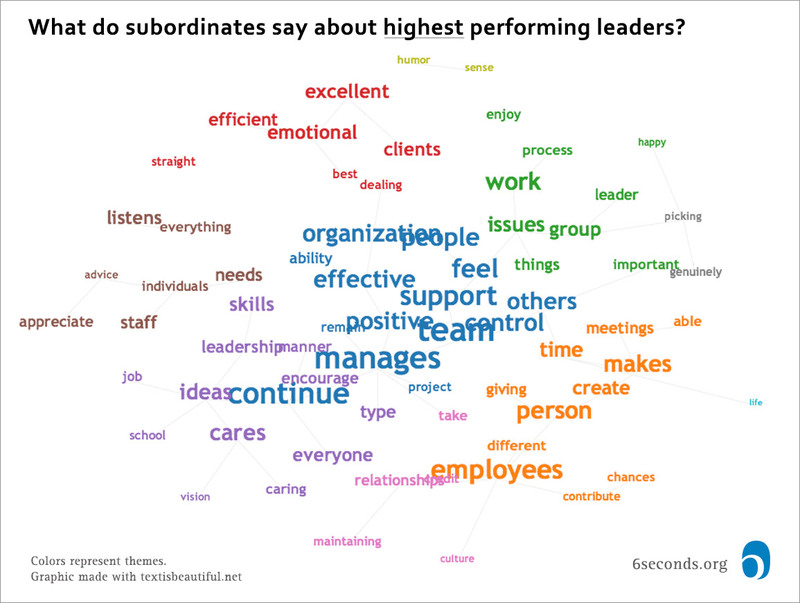 Research: 62% of comments re top leaders are emotion-driven. Feelings matter. The data for this analysis comes from the “Six Seconds Emotional Intelligence Assessment – Multi-Rater” – or SEI360. The SEI360 is used globally to measure the impact of emotional intelligence on interpersonal performance, primarily in the workplace. The feedback tool includes 24 statements about emotional intelligence, 8 statements about performance, and three open-text questions – through which “raters” provide feedback. The system allows an unlimited number of raters who are grouped into categories to provide feedback from multiple perspectives. The SEI360 is part of the SEI toolkit, a well-validated suite of assessments to measure emotional intelligence for adults and children using a robust, practical model of emotional intelligence. Visit www.6seconds.org/tools/sei for more information about the SEI toolkit. This data comes from multiple sectors – business, education, government, community organizations, and individuals. There is a balance of female and male respondents, and participants from a wide age range. The dataset is slightly skewed toward well educated professionals ages 36-55 in North America, Europe, South East Asia, and the Middle East. For the most recent information on the dataset, see the State of the Heart Report. 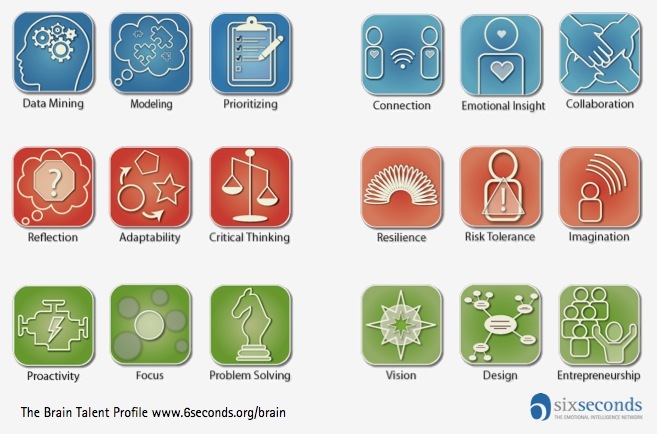 To learn more about these “Brain Apps,” explore the Brain Talent Profile. HI Josh, thank you for taking the time to shake all the bean counters who cannot see a correlation between sound, emotional leadership and bottom line success. Your graphics are mind blowing! Leaders need to create an environment to help their people to thrive and your research is helping to do just this! Thank you! Fantastic article Joshua, thanks for sharing. This is a fascinating study and I’m wondering how do these benchmarks on leadership correlate to the building of an inclusive culture? Hi Steve – great question. The data doesn’t say so specifically, but there is a strong theme of inclusion. Lots of phrases like, “creates open communication,” “makes everyone feel supported,” “very flexible and fair” — I get the feeling reading the comments that these star performers are people who their followers trust both at a personal level and to make the team work well together. Fantastic study with excellent easy to use visuals. Thank you for sharing. Not only a great read but also motivational…Openness, honesty, passion, energy, and making time should be weaved into a leader. And i do believe that true leaders create more leaders….Josh you certainly are doing that…..
That’s very kind Suniti – it’s an aspiration. Like you, when I see these words and ideas, it’s motivating: I want to be that kind of leader! I’m so inspired! Thank you for sharing! Thanks for sharing this great study! I love it! For me, it created a huge aha – effect, because I felt the success story of my previous company has been de-coded. I believe a lot of things that we did in our company were in line with your findings. And the outcome were outstanding results over a period of 16 years that I was running that company. Outstanding results not only for shareholders (13 times highly profitable double-digit sales growth in 16 years), but also for the other stakeholders (employees: very high employee engagement rates, customers: very high customer engagement and retention rates, society: regular financial contributions to a NGO that we had partnered with, many employee & customer volunteering projects, high number of employee volunteering hours). Congratulations for your organization to find the true success drivers of outstanding leadership! Thanks so much for sharing Joshua.Caring for others not only fuels success but also creates memorable moments with the team we work with. Great and inspiring article. So true in South East Asia . Take care ! Thanks Joshua for sharing your finding and interesting study. I’m new as a principal in the school and your article inspires me! It’s really open my mind! Keep on caring, sharing, loving and inspiring others! Hi Joshua thanks for sharing you vision, you goal and you action to reach it. I’m involved in EQ for Business in Italy and i’d like to get some pubblications reference, regarding the research you and your staff did to create BBP and BTP. I mean , is there a paper of the process to extract the 18 App. I have maths and logic root so i love put together pieces and create new idea to let people meet and follow IE in my country. Tks for all.